2016 was the year I conquered my Drawsoupaphobia. See I’ve always hated all Nigerian foods with a slimy texture, from okra to ogbono and ewedu. They all nauseated me and the few times I tried them growing up ended with me puking my guts out(apologies for the vivid image). 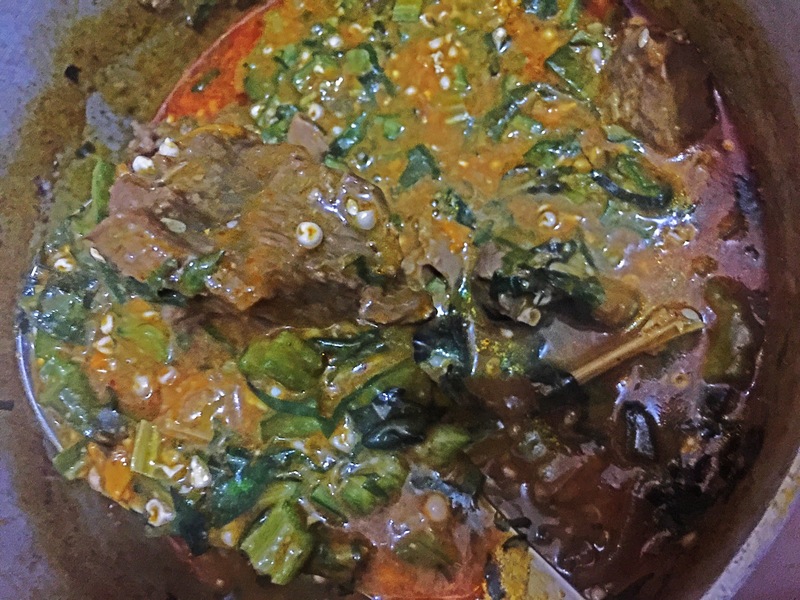 Anyways, this meant that whenever okra or ogbono soup was made at home, I would eat something else, I won’t even go into the day my dad flipped that my mum was indulging my selective palette but let me just say I starved that day! So yeah fast-forward to 2016; the year I conquered this great fear. 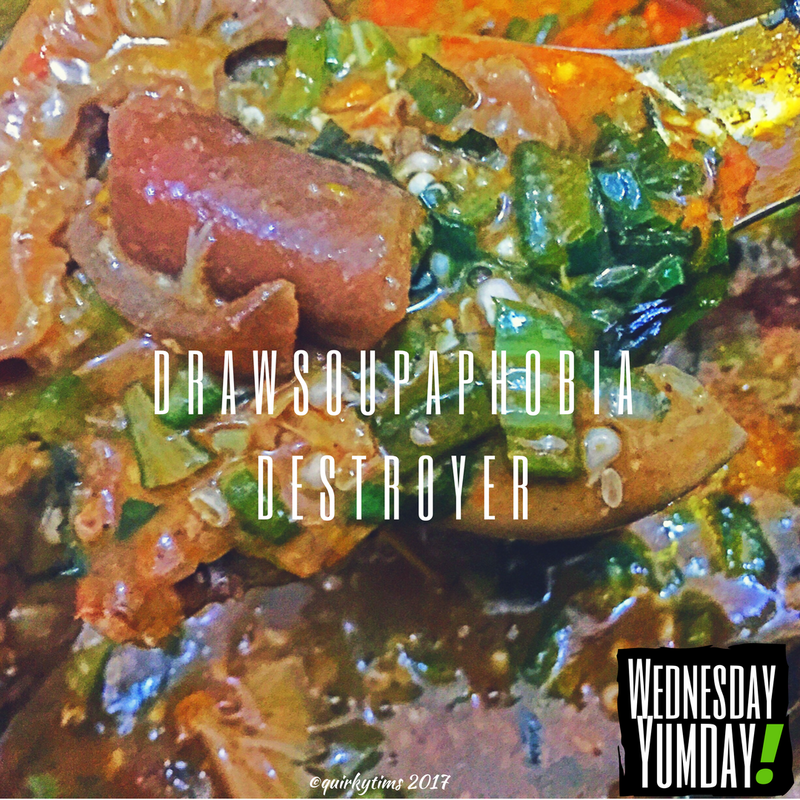 I started from an almost vegetable like consistency to drawsoup connoisseur level 1000. This means I can stare down a mean bowl of gbegiri and come out victorious. Someone shout hallelujah!!! Okra has a high resilience and this means it draws or is slimy when you process it; cooking/blend/cut. However, if you would like to maintain the resilience, you should not cover your pot when cooking the Okro. 1/2 cup ogbono seeds grounded with a handful of crayfish. 2 cups of roughly chopped Okra. 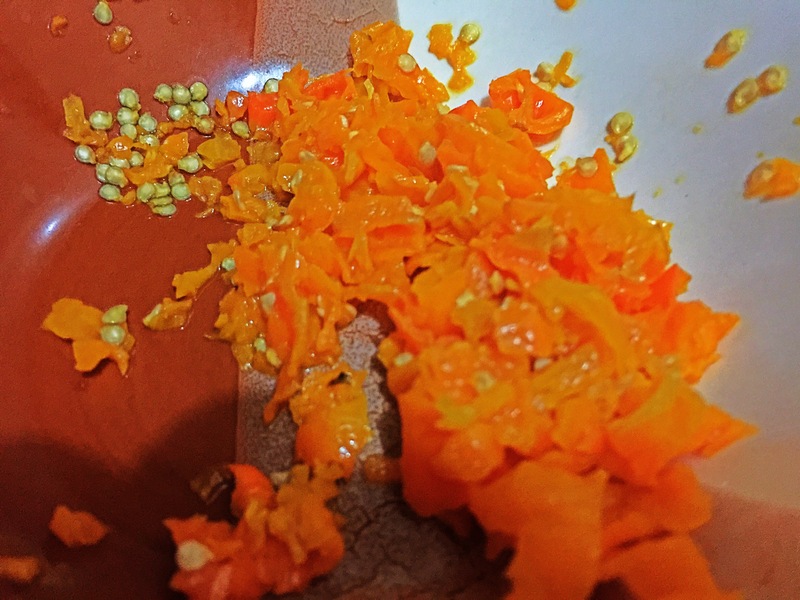 1/2 cup of chopped Uziza/Oziza leaves. 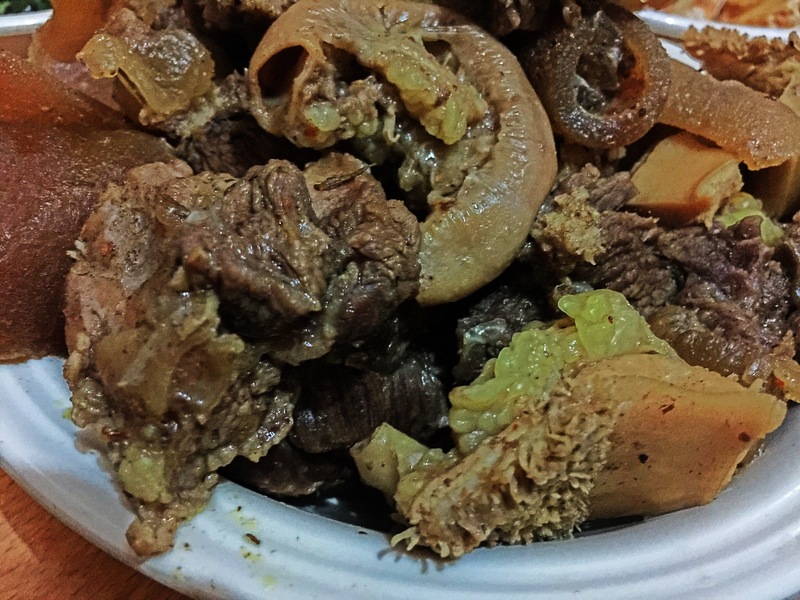 Assorted Meats(Beef, Shaki(tripe), roundabout,goat meat or your preferred mix). 1/2 cup of ground Crayfish. 1 cup of Shredded stockfish (Soak in salty water and wash properly to remove dirt and any foreign particles). 6 pieces of fresh Yellow Cameroon pepper. You can substitute with Habanero pepper(atarodo) but I just love the smell of these beautiful peppers. 2 cooking spoons of Palm oil. 2 bullion cubes ( I used Knorr). Ground Cameroon pepper (our secret ingredient). Add assorted meat to a large pot, season with salt, onion, oneKnorr cube and our Quirkytims secret ingredient; grounded Cameroon Pepper. 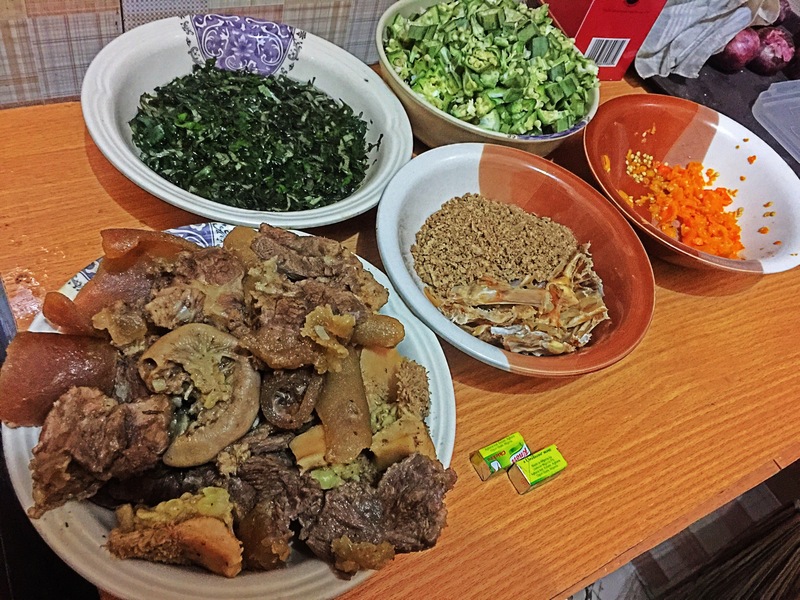 My assorted meat mix was: beef, shaki, ponmo and roundabout. Cook for about 20mins and add the stock fish. Cook for another 10minutes or until the hardest meat in the mix becomes soft, in my case it was the shaki(tripe). Roughly chop the Yellow Cameroon pepper. You can also pound if you have a tiny mortar and pestle. Add the chopped pepper, palm oil and cook for 2 – 3 minutes. 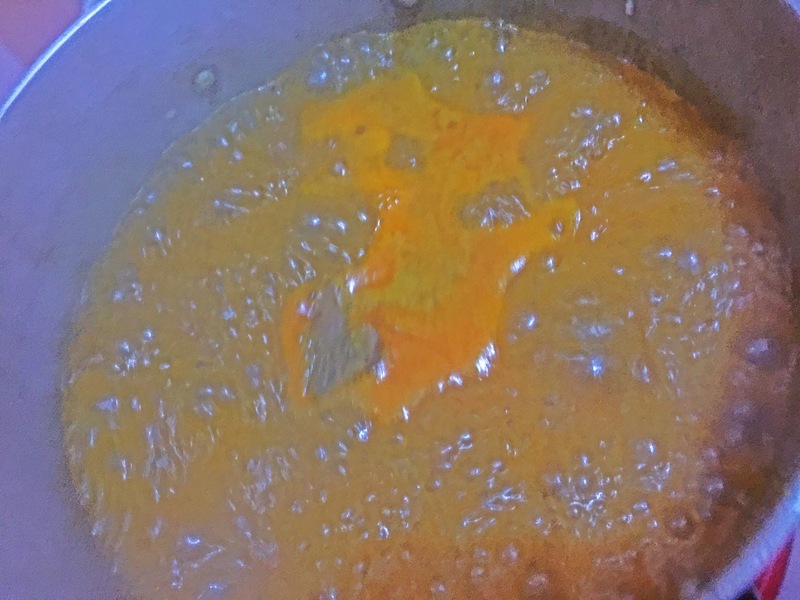 I add the palm oil at this stage so it can cook properly. Add the ground crayfish and grounded ogbono. Cook for another 20-25 minutes, you need to make sure that the ogbono is properly cooked so this will take some time. Remember to stir regularly. Now the thickness of the soup depends on your preference. If the broth becomes too thick, all you need to do is add hot beef stock or hot water and stir. Please note: at no point in this cooking process should you cover the pot as it reduces the viscosity aka “drawness” of the soup as mentioned earlier. 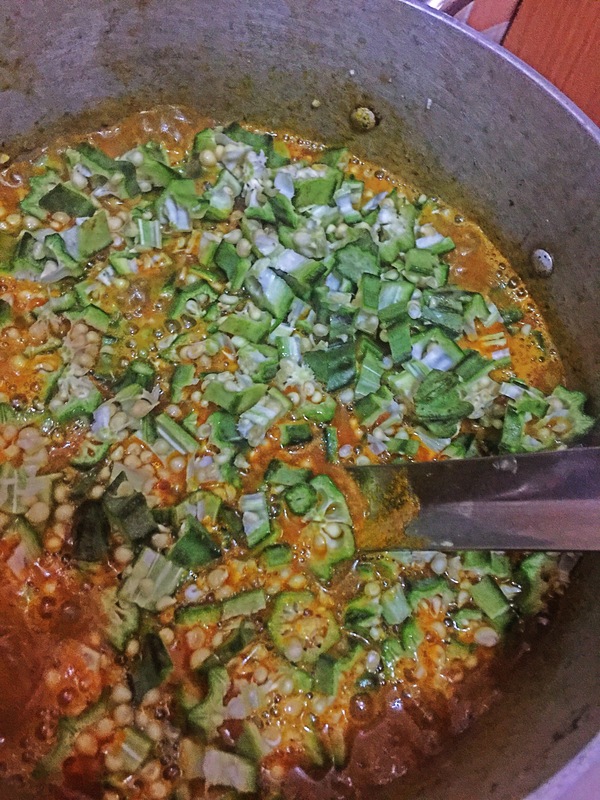 Add the okra and cook for 3-5 minutes. Add the chopped Uziza/Oziza leaves and turn off heat. QuirkyTip: Uziza leaves are the real deal. Try it and thank me later. 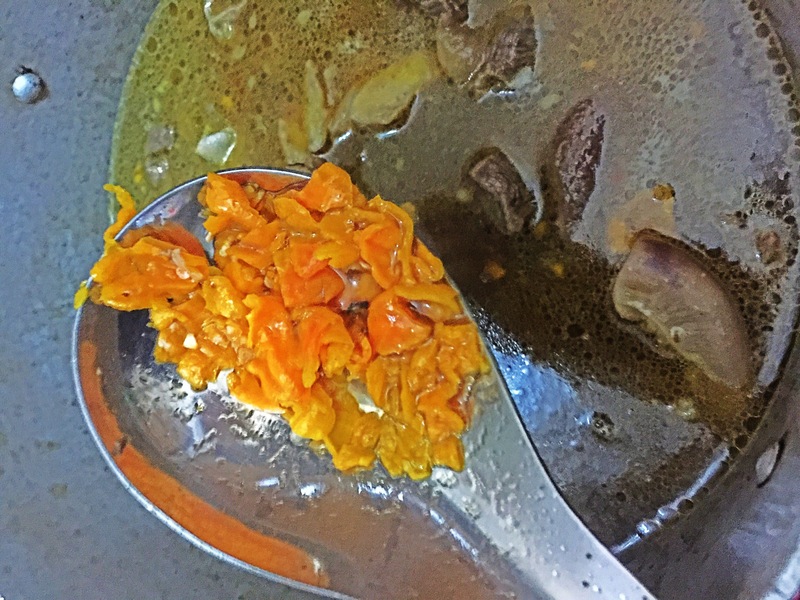 It transforms the taste and aroma of any soup; try uziza with Egusi soup and let me know what you think! Stir and cook for another 2 -3 minutes. Taste for salt and season as needed with the extra knorr cube, salt and Cameroon pepper. 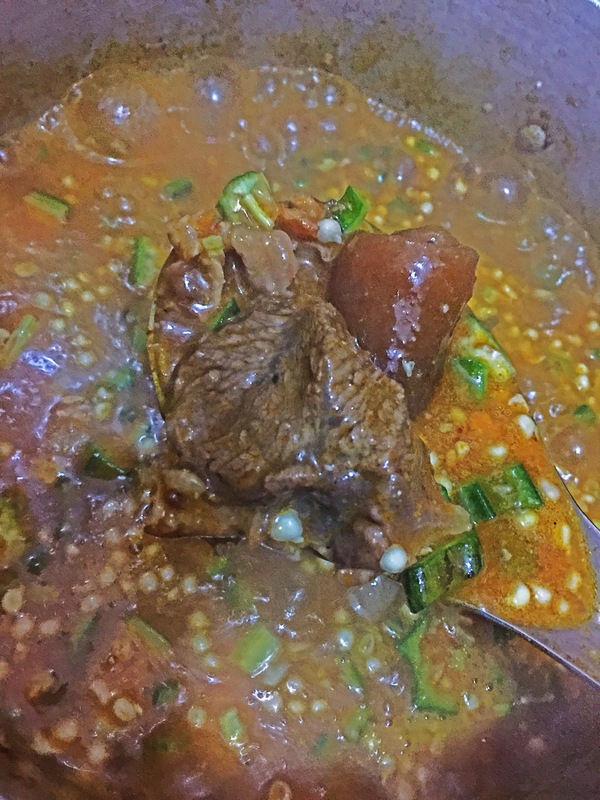 Please note: ogbono/okra soup tends to get a bit salty when it cools so the less salt the better, you can always add a pinch of salt before eating. 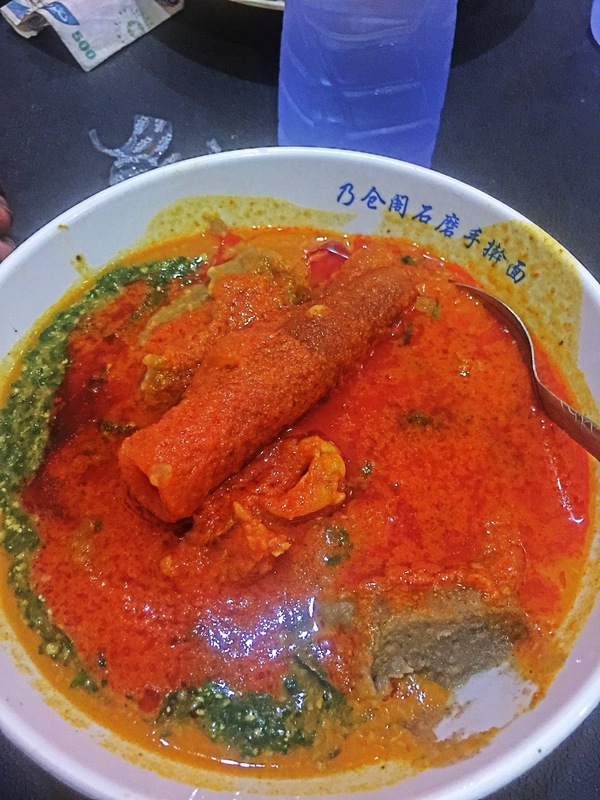 You can have this soup with any swallow of your choice; Eba, pounded yam, semo,Amala, fufu, the list is endless. You can also have it on its own as a full meal, Fitfam peeps, all you need to do is leave the palm oil out of the recipe and it is Fitfam approved! You can also try weird and quirky combinations like bread, rice and whatever your palette craves for. Hello quirkies and welcome to #WednesdayYumday! Yay!! I hope you loved our Drawsoupaphobia Destroyer. It was so much fun making this as I ensured i took as many photos as possible. Don’t forget to let me know when you try any recipe from #WednesdayYumday or if you would love me to make anything or you have a special recipe you’d like to share. I got you! Happy International Women’s Day! Be courageous, be strong and most importantly be the best woman you can be! This is to every woman that I know, striving hard to have a voice; don’t give up, someone is listening; be loud, be bold, be WOMAN!! That’s it for today, I can’t wait for #QuirkyFridays, I’m still contemplating if I should post what I have written, it’s a no-holds-barred post on being 30 and how I felt approaching the iconic age a few months ago. You know what? I think I’ll post it! Yes, so subscribe to make sure you get the notification. Oh no! Sorry to hear about that. Do you have any recipe with readily available ingredients you would like for me to make? Next Next post: Because I’m Happy!